A few weeks ago I tried my hand at cake and Oreo balls. 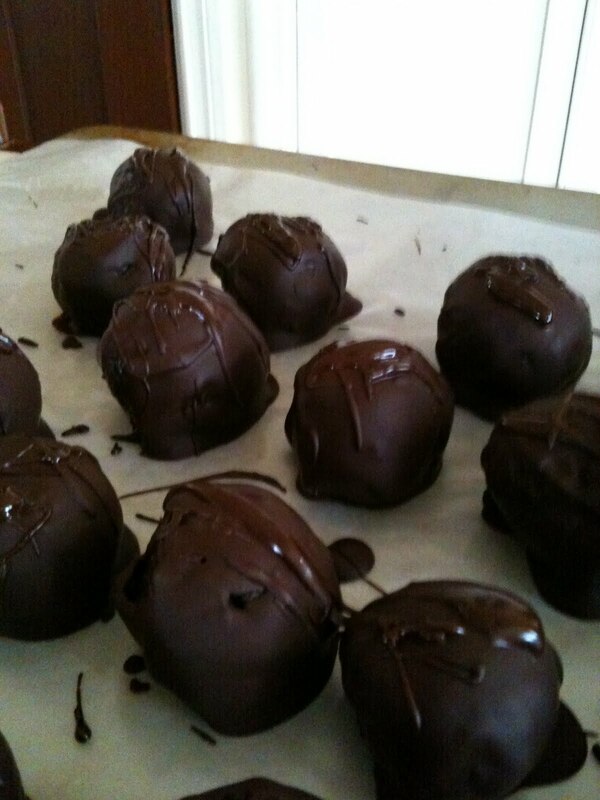 I used bakerella's recipe for the cake balls and a recipe I found on Google for the Oreo balls. So with that under my belt I decided to try and take the recipes a step farther and actually make bakerella's signature cake pops! First, you make regular cake mix. I like to dye all my creations. I tried to dye them a light pink (which turns out very nice, I've done it before with cupcakes), but accidentally poured too much red in so they came out very neon. I tried to fix one by pouring in blue, but the purple looked even worse so I left the second in all of its pink glory. That is my boyfriend's hand approving the cake mix. He so nicely agreed to help me experiment. 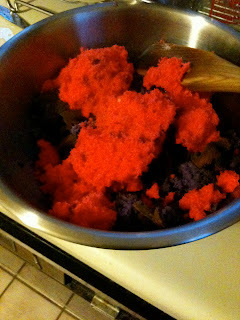 Note: If you are going to dye cake, get the white cake mix and only use the egg whites. Some colors also look better than others. Yellow looks like regular cake, seems obvious, but I did not know. I tried to make Mizzou themed (gold and black) cake balls. Light pink is ok, neon is not. Green can be fun and red is always good. I would steer clear of purple. Mine came out looking like sludge, but any pastels are generally ok.
Next I mixed up all the cake and crumbled it together. Looks fine here. Then I mixed in one 8 oz. package of cream cheese. 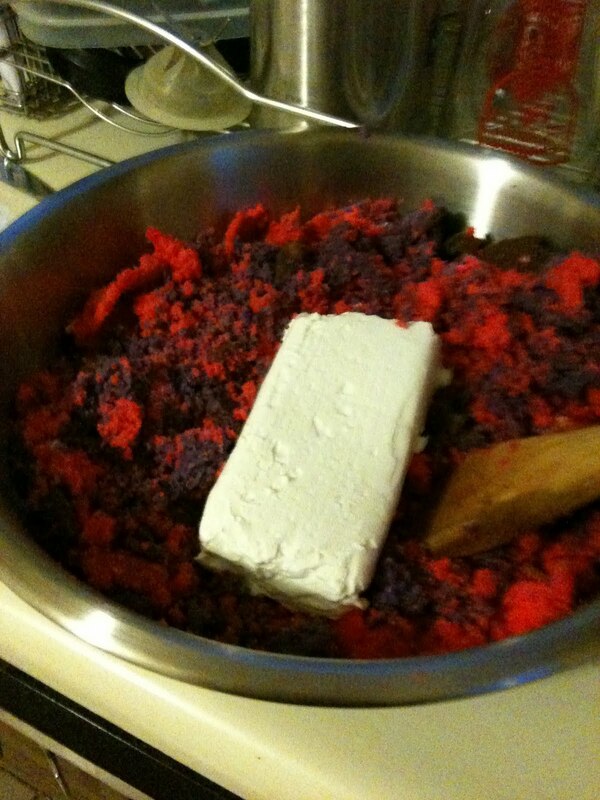 I later realized the recipe called for one CAN of cream cheese frosting. 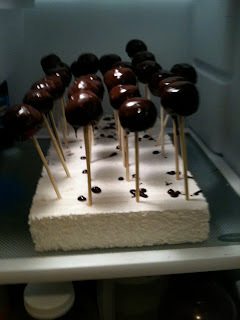 The taste was no different, but there was not enough cream cheese to hold all the cake pops together. Sad face. 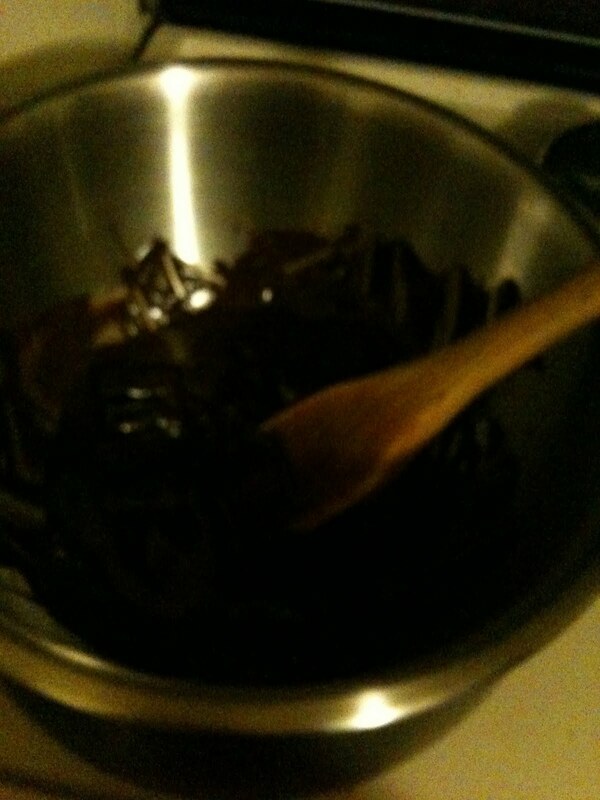 Next, I melted chocolate by putting it in a mixing bowl over a pot of boiling water. Then, Matt stuck holes in a styrafoam block to make putting the cake pops in easier. He also cut the shish-ka-bob sticks in half (and removed the pointy ends) for me. The original recipe says use sucker straws, but I could not find them at my local Schnuck's and the shish-ka-bob sticks worked great. All the cake pops cooling in the fridge! Finished product! 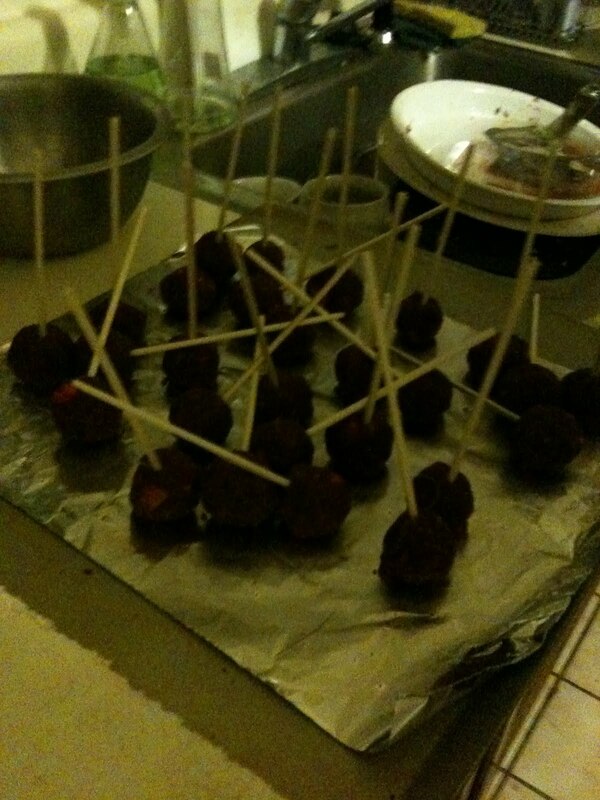 Sorry for all the bad pictures, they were taken on my phone in my dark caveman kitchen. 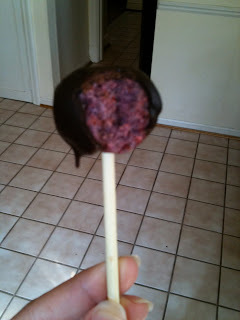 Even though I botched the recipe a bit and the colors turned out pretty weird, everyone liked them. I personally am not a big fan of these. I guess I just don't like cream cheese and cake mix together, but everyone loves them so I keep making them! Use a food processor or blender to grind the Oreos (cream filling included) and mix in the cream cheese. Then role them into small balls, dunk them in chocolate, and let refrigerate. Then you're done! This is a very easy project to do with kids, especially since mixing the Oreos and cream cheese can entail using your hands! good work! 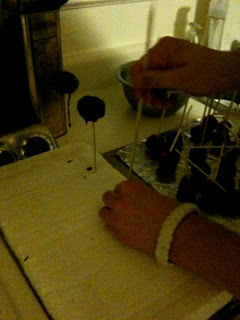 i'd never even heard of cake balls until i started blogging and now it seems EVERYONE'S making them...can't wait to try it myself! Those look sooo yummy!! I am leaving you an award on my blog! This sounds too delicious! I'd never be able to make them unless I had a bunch of friends around to share them with...or else I'd eat them all myself! Lots to post about today! Back from living under a rock!